Recommended For: Fans of myths, legends, lore and those looking for a deeper and darker young adult novel filled with adventure and romance. So I have been one of those gals who has refused to name a favorite author for as long as I can remember. However I finally realized that I’m not really fooling anybody and that it’s blatantly obvious to anyone who even casually mentions Juliet Marillier in my presence that I am just head over heels in love with this author and her work. This was a scary thing for me to realize because as I was reading Shadowfell I was holding it to a ridiculously high standard, which means there was a pretty long way to fall if this book didn’t meet my expectations. Fear not my friends, as I began reading I was reacquainted with the familiar feelings I have grown to love. I fell right into the story as easily as one snuggles under their favorite blanket and was left needing more as the story concluded. The characters are quite loveable, Neryn is younger than most of Marillier’s heroines and she is significantly different than those we have met before. Instead of leaving the comfort she knows to set out on a journey like many of Marillier’s past heroines, the story begins with her at rock bottom. She is left with nothing. No family, no home and only an inkling of where to go next. She was written in a much more naïve voice than I was used to and it really reflected the difference between the young adult and adult novels by this author. I appreciated the fact that this character didn’t seem too “old” and that the reader was able to watch her grow as the story progressed. I loved Flint (no surprise there) and I love the extreme duality of his life and both the angst and honor that made up his character. I am hoping that the secondary characters become more fleshed out in book two (and I’m sure they will) because the glimpses we have been given are extraordinary! I’ve reviewed a few Juliet Marillier novels while working on this blog and it always boggles my mind how the author manages to make me feel comforted with her words yet also blown away at the different worlds and characters. Like Wildwood Dancing and Heart’s Blood, this novel was reminiscent of the world of Sevenwaters, yet at the same time it was profoundly different and glorious in its own way. The biggest difference found between Shadowfell and her previous novels is the fact that all of Juliet’s other “series” are made up of companion novels and not sequels. Shadowfell is different. I turned the last page and was met with a blank canvas, an ellipsis, if you will. This left me feeling an entire new range of feelings over the story. Never has Juliet left me wondering just where those characters were going and more importantly, what would happen to their love!! Marillier has a knack for slow burn romances but this one was left hanging just as the reached it’s peak! I wanted more, I needed more and I was left with my mouth dangling open in a “Touché, Ms. Marillier” moment. 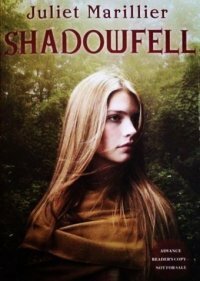 It’s a new world Marillier brings to life in Shadowfell, we are taken away from the lush green that we readers are used to while in her world. One of the things I loved it the introduction of new “Other” characters. I immensely enjoy reading about these characters and I really appreciated the way that this book represented a different type than I had read of before. I was impressed by the intricate storyline and constantly found myself wondering what was going to happen to these characters in a way that excited to me to no end. Though this story was reminiscent of Marillier’s other pieces of literature, it was not my favorite, and I believe this is because I found that my heart wasn’t breaking and mending as much as when I read her adult novels. This is in no way a negative aspect of the novel, it was merely a different journey than what I was used to from this author. This novel is a story of hope and desire on many levels. It showcases the journey one must make to become the person they are meant to be and it was a beautiful beginning to another trilogy that I am sure to love. This entry was posted in Reviews, Young-Adult and tagged fantasy, heroine, magic, romance, young adult. Bookmark the permalink. I must say, I am very much looking forward to introducing myself to her work. Thanks for this and for suggesting her to me! I’ll be sure to let you know how I like it when I am done. *Sigh*, reading JM love just makes me so happy every time. I wish I’d loved this book just a little bit more, but I certainly enjoyed the same aspects about it that you did. I particularly adored Flint, and feel that without him I would have been drifting. I’m excited for the other characters to be more flushed out as well, particularly some of those we met only at the end of Shadowfell. I was so so worried she was going to leave me hanging and I was going to have to throw the book against the wall, but I was happy that even though it is a series, the ending that I needed was there. Looking forward to the next one! I can see the flaws and I think that, like you, I would have loved it more had it been from another author. My standards are just too high!! She left me hanging a bit with the love though I mean he was going off and there was confusion and just…I freaked out. I still loved it but I am not used to her not giving me a conclusion!! Glad to see your review-I haven’t read much Marillier but am looking forward to checking out more of her work such as this book.